Find the bill of lading form you need to complete your export shipment. 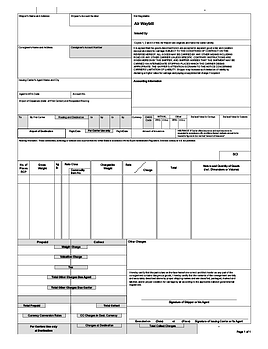 Download a free, printable bill of lading template. A bill of lading serves different purposes. First, it is a contract for the carriage of goods between the shipper and the transportation company. Second, it serves as a receipt issued by the carrier upon taking possession of the goods. Third, it may serve as a document of title that permits its holder to obtain title to, and possession of, the goods. These transport documents expedite an export shipment from the time of departure from your facility to delivery. When freight changes hands from the shipper to the carrier, it is the signature on the bill of lading that signifies that the goods have been received in "good order." That is, the goods are in the same condition as when they left the shipper's facility, or a "clean" bill of lading has been issued. A bill of lading without any comments regarding damage, overage or underage can play a crucial role in permitting the seller to receive payment for the merchandise. For international shipments, an inland bill of lading form is often the first transportation document issued for the international shipment. It may be prepared by the carrier or the shipper and then signed when the carrier takes possession or picks up the cargo. The inland bill of lading provides information on the products shipped, marks and numbers, the name and address of the international carrier in the seller's country, the weight of the shipment, how it is packed, and references to the carrier's limited liability. Our Shipping Solutions export documentation software allows you to quickly and easily prepare an Inland Bill of Lading and print it out on plain paper. 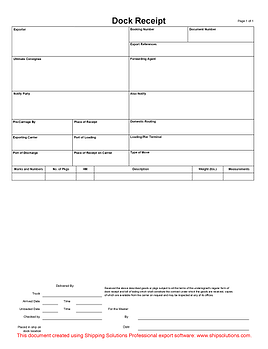 You can download a free Inland Bill of Lading template from our website in PDF format. You could complete these forms five times faster with Shipping Solutions. As a document of title, the ocean bill of lading form authorizes the holder or another party to take possession of the goods. There are two categories that should concern us here. The straight bill is used when the shipment is consigned directly to the named consignee and no other party. Typically this type of consignment is used for open account or cash in advance transactions. The consignee can obtain possession of the goods after arrival upon presentation of a signed original bill of lading to the carrier. The ocean bill of lading consigned "to order" or "to order of shipper" is negotiable once it has been endorsed on the back by the shipper or their representative. The endorsed original ocean bill of lading is usually sent to the bank in the buyer's country and held until the transaction is satisfied under a documentary collection, cash against documents, or a letter of credit. Once the endorsed original ocean bill of lading and other required documents are in the hands of the buyer, the buyer can transfer the bill of lading. Our Shipping Solutions export software allows you to quickly and easily prepare an Ocean Bill of Lading and print it out on plain paper. 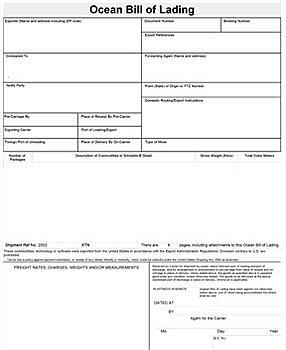 You can download a free Ocean Bill of Lading template from our website in PDF format. The air waybill (AWB) is the equivalent of an ocean bill of lading used in air transport. However, the air waybill form cannot be negotiable; in other words, it may not be consigned "to order of shipper." An AWB is the document that controls the routing of the exporter's cargo while it is in the hands of an air carrier or a consolidator. The air waybill is a contract for carriage. The face of the air waybill identifies the shipper, the consignee, the carrier, the notify party, the freight forwarder, routing, the description, weight and dimensions of the cargo, freight charges, and the relevant anti-diversion clause. On the reverse of the air waybill, the carrier's contract with the shipper and consignee are detailed. Once the endorsed original AWB and other required documents are in the hands of the buyer, the buyer can transfer the bill of lading. Our Shipping Solutions export software allows you to quickly and easily prepare an air waybill and print it out on plain paper or on an air carriers preprinted form. 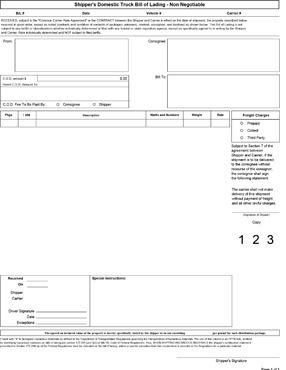 You can download a free air waybill template from our website in PDF format. The dock receipt form is designed to provide the shipper/exporter with proof of delivery of the cargo to the carrier in good condition. The inland carrier may deliver the goods to a warehouse company or to a warehouse operated by the carrier as arranged by the freight forwarder. The dock receipt is usually prepared by the freight forwarder and is signed by the warehouseman or agent for the carrier upon receipt of the goods. Descriptive information helps the steamship company keep track of the shipment on the pier. The inland carrier provides the dock receipt to the freight forwarder as evidence that satisfactory delivery has been completed. Once the endorsed original ocean bill of lading and other required documents are in the hands of the buyer, the buyer can transfer the bill of lading. Our Shipping Solutions export software allows you to quickly and easily prepare a dock receipt and print it out on plain paper. You can download a free dock receipt template from our website in PDF format.